The gunner had a 180 degree view toward the front through two unity power periscopes in front of his hatch. A 4x and 12x day/night (thermal) sight was provided as the primary sight for the guns and the TOW missile. A 5x auxiliary sight also was installed to be shared by the gunner and the vehicle commander. The vehicle commander had 360 degree vision through seven unity power periscopes around his hatch and an optical relay permitted him to see through the gunner's day/night (thermal) sight. An external sight also was installed for open hatch firing. The vehicle radios were located in the turret bustle. 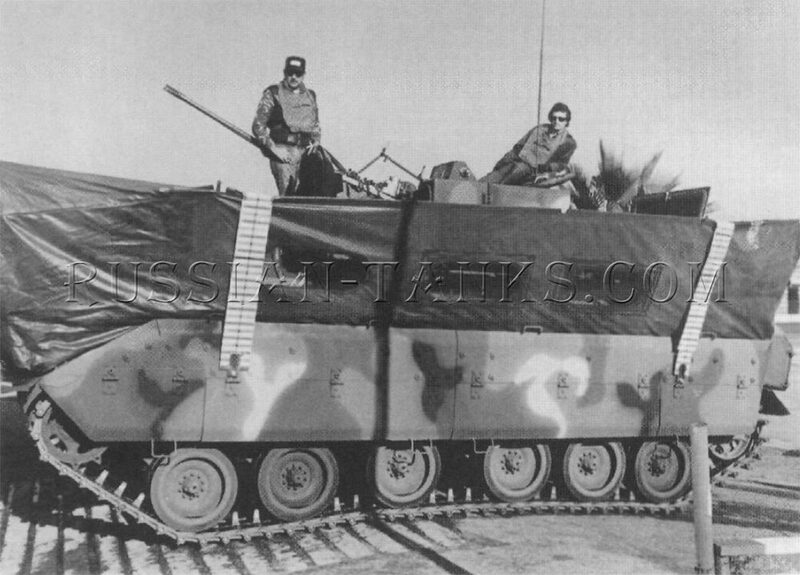 The M2 infantry fighting vehicle provided space for six soldiers in the squad compartment. Six M231 5.56mm firing port weapons were carried for use in the six firing ports. Two of these were located in each side and two in the rear ramp. 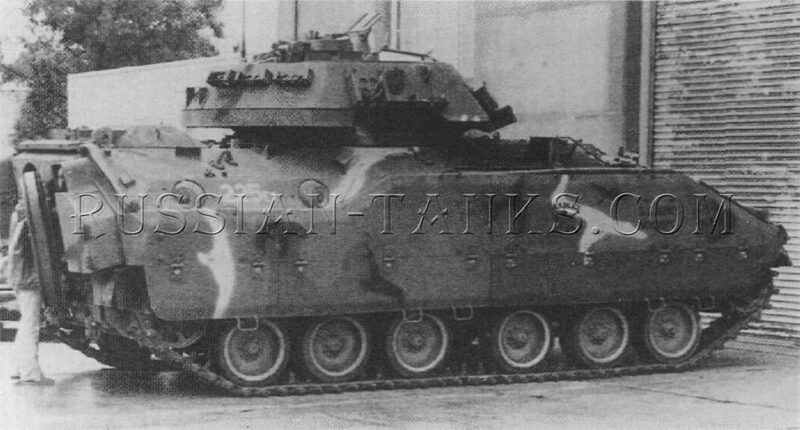 The M3 cavalry fighting vehicle had space for two observers in the rear hull. No firing port weapons were carried and the ports were blanked off. On both vehicles, three periscopes were installed in the hull roof between the cargo hatch and the rear ramp. Two additional periscopes were mounted on each side above the firing port locations. The small scout motorcycle originally proposed for the M3 vehicle was eliminated. The hull and turret on the Bradley were assembled from 5083 and 7039 aluminum alloy armor combined with steel spaced laminate armor. The latter consisted of two l/4inch thick, high hardness, steel plates spaced one inch apart and mounted 3 1/2 inches outboard of the one inch thick aluminum armor. This provided protection against the Soviet 14.5mm armor piercing round and fragments from the 152mm high explosive shell. A 3/8 inch thick steel armor plate was installed on the front third of the hull bottom for mine protection. The Cummins VTA-903 diesel engine, now rated at 500 gross horsepower at 2,600 rpm, was installed in the right front with the General Electric HMPT-500 hydromechanical transmission. The final drives and sprockets were at the front and the vehicle was supported on a torsion bar suspension with six dual road wheels per side. One dual and two single track return rollers supported the upper run of the 21 inch wide, single pin, track. 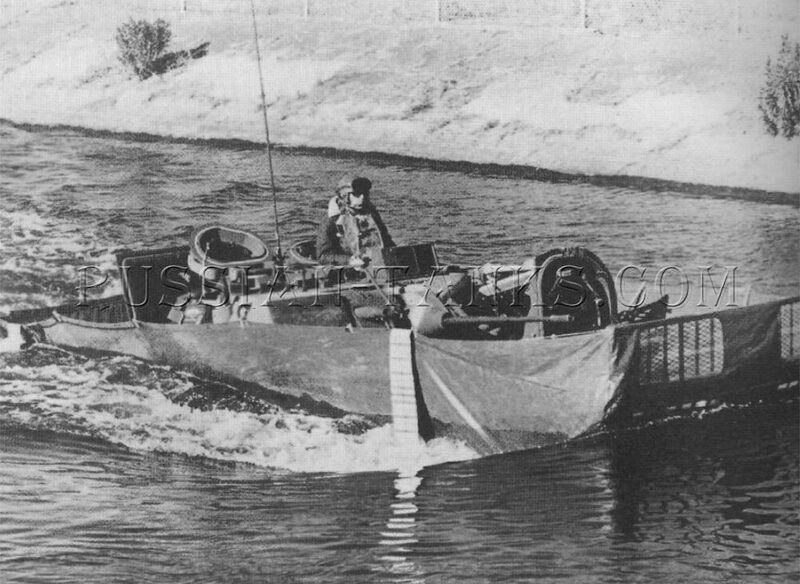 The vehicle was amphibious after erection of the trim vane and the water barrier. Combat loaded, the M2 and M3 weighed 50,259 pounds and 49,945 pounds respectively. The maximum speed was 41 miles per hour on roads and 4.5 miles per hour in water. The cruising range on roads was about 300 miles. 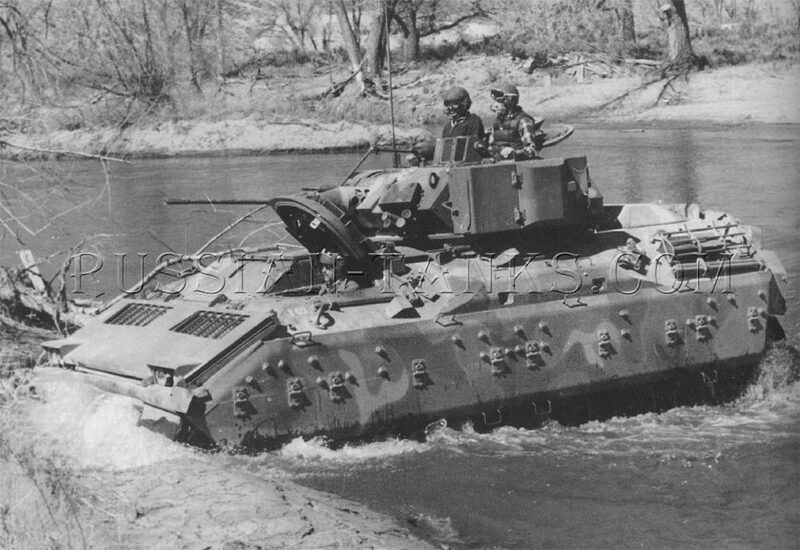 With the Bradley in full production and service experience available, work continued to develop improvements to the basic vehicle. These were the Block I modifications that combined three major development programs with some minor modifications. The three major programs were the introduction of the TOW 2 missile system, the installation of a gas particulate filter unit (GPFU) for NBC protection, and various IFV/CFV design changes. The minor modifications were primarily electrical to reduce the logistics problem resulting from multiple configurations. 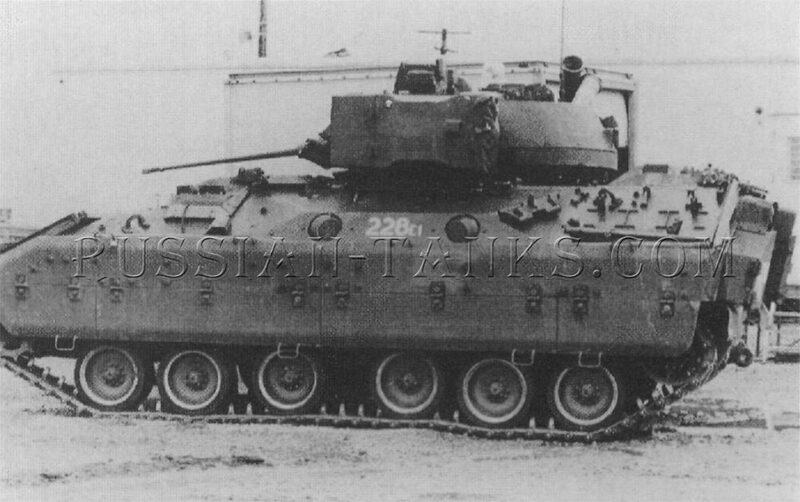 By late 1984, prototypes incorporating many of the improvements were under evaluation at Aberdeen Proving Ground. 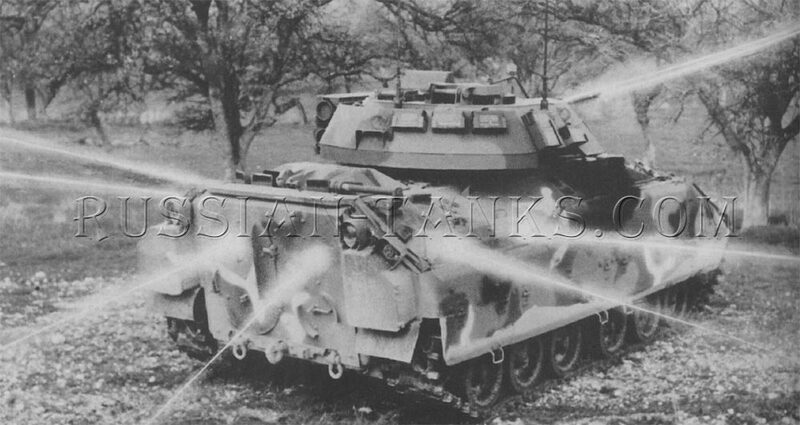 These prototypes, converted from M2 and M3 vehicles, were designated as the M2E1 and M3E1 and they combined a mixture of old and new features. The new TOW 2 missile system was installed on both the M2E1 and the M3E1. The TOW 2, with its full six inch diameter warhead, provided a more powerful weapon for frontal attack on the latest Soviet main battle tanks. The earlier TOW missiles also could be launched from the new system. At one time, the replacement of the twin tube launcher by two separate launchers was under consideration. These new armored launchers were of cast construction compared to the riveted assembly of the twin tube launcher and they were to be installed with one on each side of the turret. The twin tube launcher was canted slightly inward to allow the tracker to acquire the missile more rapidly. However, tests indicated that this was unnecessary and the two separate launchers were not to be canted. After further evaluation, the separate launchers were not adopted and the twin tube design was retained (U.S. Army).